I am a Pastor in a local church. In the past I worked for a few years in a funeral business. No...it does not make me an expert but it did show me people walk through the funeral home door, either at-need or to pre-plan and know absolutely NOTHING about this MAJOR purchase they are about to make. The ONLYsource of information is from those who stand to benefit from their decisions. Nowhere can they find truly unbiased, totally neutral information. Yes, there are books and much information on the internet but face to face information to sit and talk does not exist. I am currently putting together informal information sessions to simply talk, answer questions as honestly as I can. My aim is to create informed individuals who can hold their own when they go to pre-plan. I am planning on starting these sessions with the members of our congregation. This is in no way pre-planning a funeral as I am not a licensed funeral director but I do know my way around a funeral home and have had numerous occasions to assist family and friends in planning their own or the funeral of a loved one. 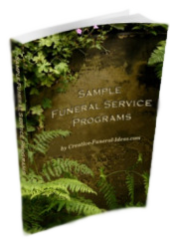 I am hoping to acquire catalogues to show people the various caskets, metal, wood, cloth covered...yes, clothcovered -something some funeral homes don't been carry anymore. It is a legitimate choice. I want them to know about sealed caskets vs non-sealed caskets. I want them to know about adjustable beds etc. I also want to show cremation urns. 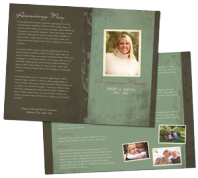 I have a few catalogues showing that product. If INFORMED individuals WANT to spend $20,000.00 on a funeral, that's great. I love it. But if that INFORMED individual wants or can only afford a $ 1,000.00 funeral then that is also great. The fundamental message I want to leave with them is this. The amount of dollars you spend on the final disposition is not indicative of the love and caring you had for that individual. MANY times GUILTdictates the amount spend. Other times it is keeping up with the Jones, embarrassed to choose something less ostentatious. This is all so wrong. Money will play no role in what I am going to be doing. Well, I have kept you long enough but you can probably detect my excitement about offering these information sessions to those who need them SO much. P.S. How did you happen to get into this line of work? What you are doing is very worthwhile. This isn't work, it's more like a passion. 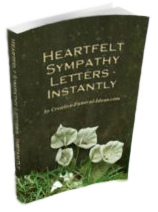 I have lost several family members over the years, and have seen how helpless people become, when planning a funeral. I also hope you inform people about what happens to the body when it is embalmed. Not too mention all the chemicals that leach into the earth, because of the embalming. Even I was tricked last year, when my brother passed away. The funeral home told us that even though he was being cremated the law in this jurisdiction, required he be put in a coffin. He then took us into a room and showed us the expensive caskets. I managed to convince my nieces and nephews to keep the environment in mind, and go for the plain pine box. ($500 instead of $5,000). Afterward, I realized we could have selected a plain cardboard ‘box’ coffin! But that was never suggested. In my little way I am helping inform people. My site receives 2000 visitors a day, so there is a demand for this information. EVERYTHING is very well orchestrated when the family comes to make arrangements. Nothing is left up to chance I promise you. In the casket selection room, the lowest cost casket is ALWAYS near the door to the right as you walk in. Sometimes it is not even in the same room as the rest of the caskets. I have seen the low end casket sitting on the floor under a more expensive one. It is designed that way so you will be turned off by what you see walking in and slowly warm up to the other more expensive models. The bronze and copper is always very well presented, well-lit, etc. Not by accident. The cloth covered caskets are also interesting. I happen to like them and find some of them very nice. However, in order for a funeral home to say they have a WIDE selection and a WIDE range of prices they include a cloth covered casket in their showroom. BUT, they choose a color which you would NEVER choose; PUTTY grey, SHOTGUN metal grey etc. I have seen some where the bottom of the actual box is one color fabric and the top ( the rounded portion which opens ) another totally different fabric. It looks like they ran out of one and had to use another. No on would choose that! I have seen cloth covered caskets which were flat top and the portion which opens for viewing did not have any hinges so it came off completely and was leaning against the wall in the corner. Very sad. I know the box does not matter AT ALL. However, for those who want to buy something nice AND affordable it should be available. Watching the funeral directors drive big fancy cars really irks me. NOW, having said that, they do work hard, I have done it but it's the access that bothers me. If they carried nice cloth covered caskets, people would choose them and guess what, their profits would be less. The usual mark up for caskets is 160%.I am not good at math but they tell me that means multiplying the wholesale price by 8. WHAT A PROFIT! It never ends. I could tell you more but will stop for now. It would be interesting to talk on the phone sometime and compare notes. It is a right blog with right information...i will follow you.. I would contact the funeral home and ask for documentation showing where whomever made the arrangements - was given permission to do so. Don't threaten the BBB as that may not concern them - tell them that you are considering contacting the Consumer Protection Agency or Atty General's office if they refuse to provide the info to you. Your Mom or Dad would have had to have some type of documentation giving permission to whomever made arrangements. I question why the Funeral Home didn't ask where the children were and why they were not involved?? Def check into this further. get what u pay for ? Not Hardly ! Having no knowledge of prepay funerals, my mom wanted this for my dad and her. I signed off on the 2 at the local most well-known funeral home in Hammond, La. in 1998.I was not informed that the pre-needs was irrevocable just gave a check sheet for purchase signed by me in august. In Oct. the cash was invested in Southland Investments drew interest for MFH until my dad passed in O7 and mom july 1O. I was totally passed by at the gravesite, the Bible and guestbook gave to another family member. When mom was dying I called MFH, told them I didnt want the other plan used, GREED had set in with family and they were acting like vultures over the estate so anticipating heartache and more ugliness i stayed away. I asked MF H to call me when mom passed gave 2 ph. no. to reach me, NO ONE CALLED ME, I Found out 8 HRs. later, PLANS HAD BEEN COMPLETED when a relative called me. I called MFH was lied to at first they said my mom wasnt dead then said the plans are made, and theres nothing i could do to stop it and hung up on me. REMEMBER I WAS THE PURCHASER -Where were my rights? I am considering legal action, the pain is still so raw. PLEASE know it happened to me, IT CAN HAPPEN TO YOU ! Dont sign on the dotted line if your rights arent explained in writing. Once the FH has your money they arent giving it back and in my case MFH had been paid so they wasnt going to let that go and take the chance that the GREEDY BUNCH wouldnt pay or use their funeral home. I know this FH has a beautiful new FH as their competitor so maybe thats why they have to stoop to such low morals and guess what? ONE Of THEIR OWN FAMILY OPENED UP THIS GORGEOUS NEW FUNERAL HOME. Know your rights people just as we all know DEATH is never easy and even when you think your family will be there for you GREED and EVIL walk HAND IN HAND. I tried to do good but it was one of me I only pray God will see me through. Money was never the issue but RIGHT FROM WRONG WAS. read the Psalms 26-36 and you will know how thine enemies will rise against you, GOD BLESS.